We had a yarn swap last week at the KnitSmiths, and I picked up a bunch of Bebe Lang Superwash in pretty baby colors. I decided to use it to make a Christmas sweater for Bulis, my best friend's baby girl. Well, she'll be 18 months old by Christmas... making her my best friend's toddler I suppose. Anyway, I'm using a derivation of the Sirdar pattern that I used for Henry's sweater. I've taken out the ribbing, and have added some stitches width-wise to make up for the stretchiness that I've lost by knitting it all in stockingette. It's going pretty well, I made a small mistake and didn't decrease enough on the armholes but I don't think it will matter. 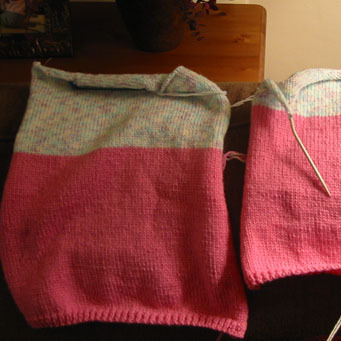 I'm planning to use the pink again for the roll-neck, and perhaps for the ribbing on the sleeve cuffs. This is my first attempt at "designing", we shall see how I fare!